Essadro Jefferson being escorted from the Magistrate’s Court in John’s Hole on Friday, September 7. 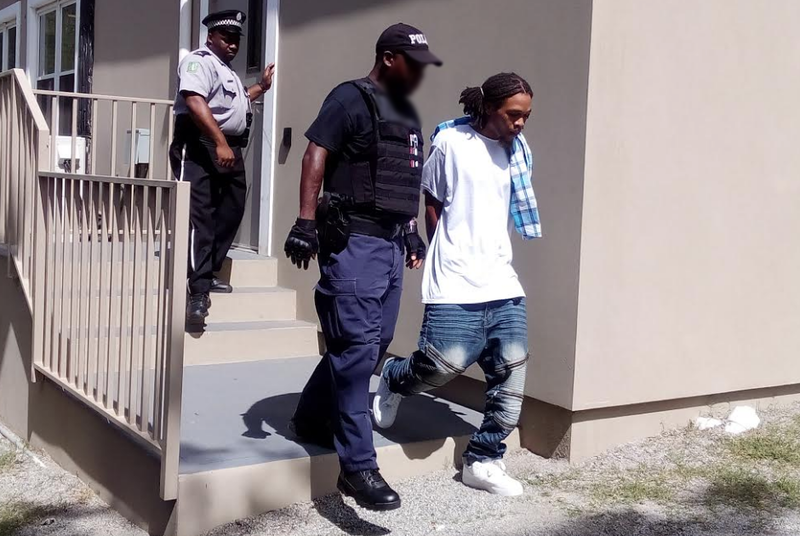 Essadro Jefferson finally made his first appearance in the Magistrate’s Court on Friday, September 7 – which is more than a year after being charged for the conspiracy to murder David Springette. Principal Crown Counsel Tiffany Scatliffe-Esprit told the court Jefferson’s matter was read in court last year but the accused man reportedly refused to leave Her Majesty’s Prison to make a physical court appearance at the time. Jefferson refuted that claim when he appeared before Magistrate Hakim Creque on Friday. He claimed prison officers dishonestly concocted that story. The accused, who is being represented by defence attorneys Valerie Stephens-Gordon and Stacy Abel, was not made to plead during his appearance. That is because is matter is indictable, which means it is likely to be heard at the High Court before a judge and jury. The man Jefferson is accused of killing was fatally shot on June 21 last year after two previous attempts on his (the murder victim’s) life. Jefferson is jointly charged for the murder with Shakeel Ryan and Shakilla Hanley who made court appearance of their own last year. All three accused persons are yet to be tried. Jefferson is scheduled to return to court on October 24.